We also have two run spaces and access to a large training ground for our dogs. 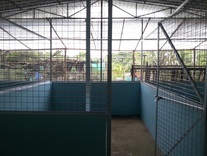 SPONSOR A KENNEL SPACE - "MY SPACE"
Paint it, Decorate it, bring in toys. We have 15 kennels we need help and sponsorship for. Dedicate your Kennel Sponsorship as a gift or in memory of someone. Kennels can be sponsored by more than one person or group up to the maximum amount needed on a yearly basis. All our generous sponsors will receive their own certificates. Our Yearly Kennel Sponsors will be recognised with their own plaque.